Latest sad stats….. 618 rhino murdered so far this year in South Africa alone. This is heading for 40% more deaths over than last year’s terrible record. To put this another way – the poaching rate is 1100% greater in 2013 when compared to 5 years ago. This is a catastrophic situation. Totally un-sustainable. Sickening. Heart-breaking. The slaughter must be stopped. Please help in whatever way you can. 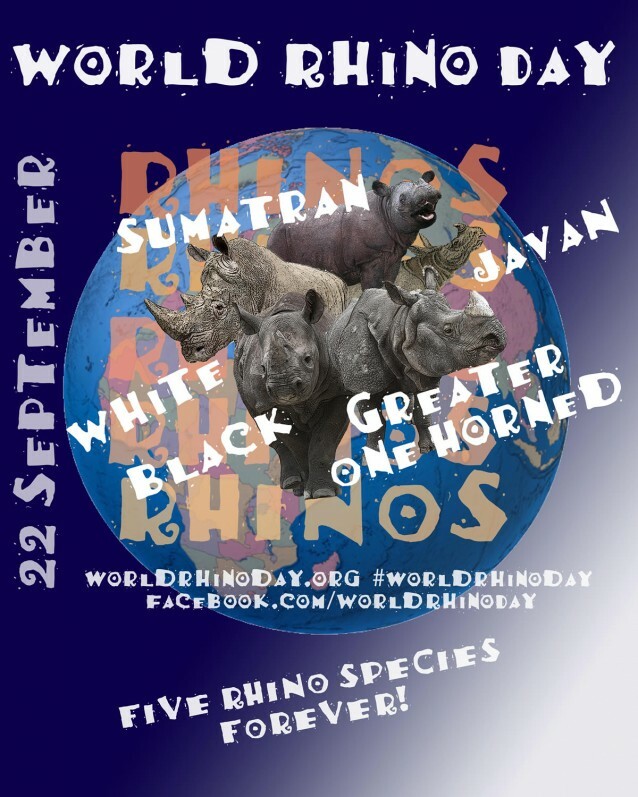 22nd of September is World Rhino Day. I’m hoping that this will help to draw attention to the plight and to celebrate these beautiful creatures and let the world know how sad it would be if they were extinct. Wherever you are in the world, please check out the action in your city (http://www.worldrhinoday.org/ or https://www.facebook.com/WorldRhinoDay). As far as my progress I have made it to Danneberg (on the Elbe) between Berlin and Hamburg. I have now completed 1100km with 700km to go. This was a planned break point in my walking, yeah! In mid August I went to the Herzog Cancer Clinic for some hyperthermia treatment, then home to Australia to see my family, friends and doctors. 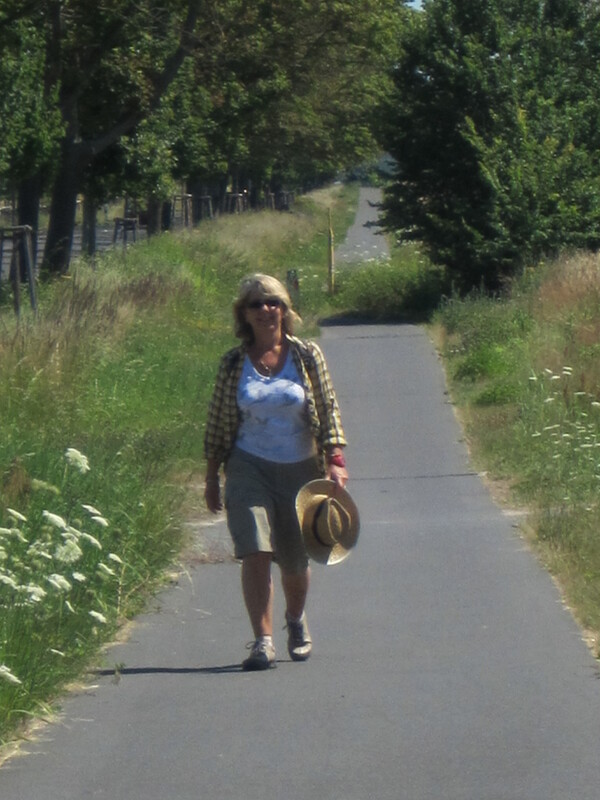 I am very happy with my walking progress thus far and my health is good. Currently no signs of the cancer recurring. Had some interesting experiences on my walking. The eastern states of Germany were great, wonderful forests and fields, villages and cities. Met the “forest watch” man on his tractor just before Oranienburg. He warned me to leave the forest immediately as several wolves had been seen in the vicinity earlier that morning! He then left me and I had a very rapid and nervous walk to the nearest village. Every noise made me jump as I wrote the headlines – “Woman killed by wolves while walking to save the rhinos”. Anyway, I made it out safely and continued my walking the longer path next to the road. The main problem for the last 300km has not been wolves, but mosquitoes! The high water this year has contributed to a plague of mossies in the eastern half of Germany. They are big buggers! I learned to walk faster and not to stop for photos. Really enjoyed Berlin and Potsdam. They are wonderful worldly cities dripping with history, with cosmopolitan people and a genuine bustling exciting culture and vibe. The area is surrounded by lakes. There are 66 separate lakes in what is called Havel-land. 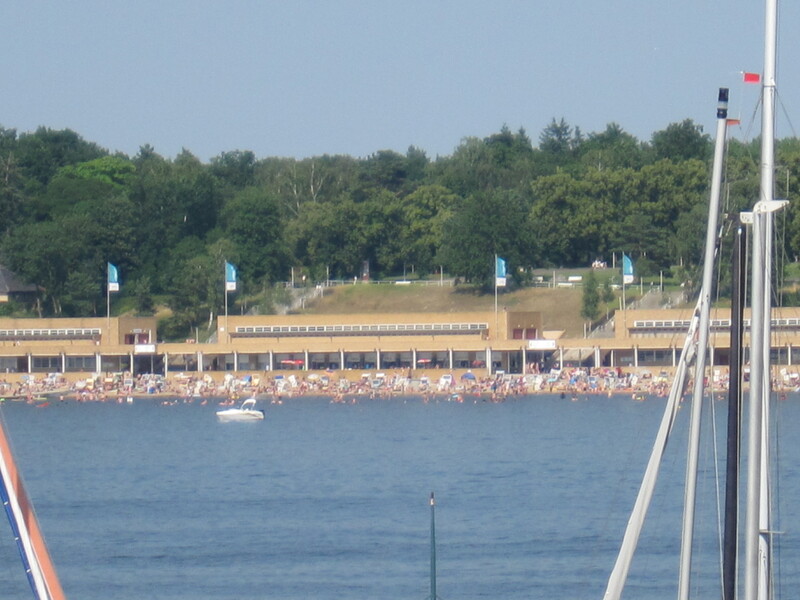 These include the wonderful Wannsee and the unfortunately named Hellsee. In Berlin several friends from Adelaide, Australia and Ochtendung, Germany joined me. We had some days exploring including a great visit and press conference in the Berlin Zoo. This led to some very good articles in the local newspapers. 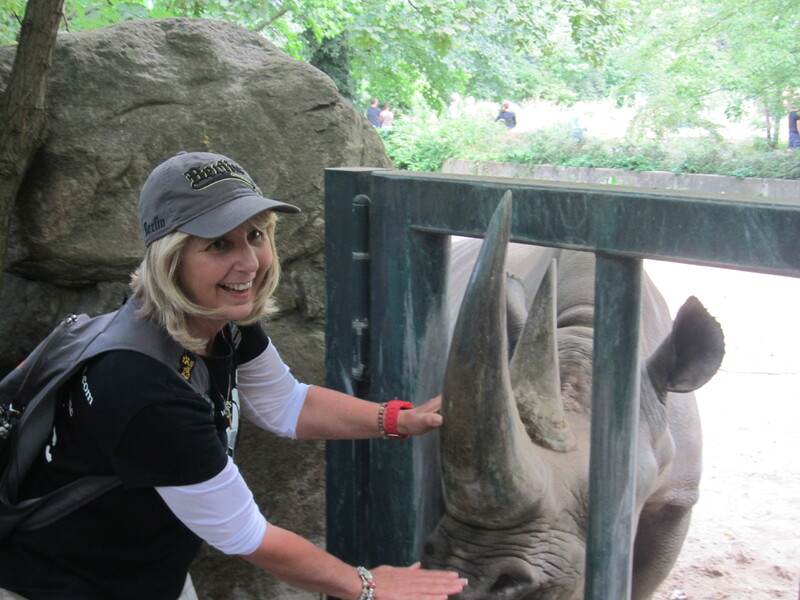 See https://gabywalksforrhinos.com/press/ Press page and a fantastic photo that was picked up by Animal Planet – http://blogs.discovery.com/bites-animal-planet/2013/07/cancer-survivor-walks-to-save-rhinos.html#mkcpgn=fbapl1 link here. The Animal Planet subscription is very large and that week this article dramatically increased my Facebook reach to 195,000 !! This is huge and I hope this translates into broader and deeper awareness of the situation as well as donations to aid the projects. As the statistics prove, there is much help needed to improve the odds for survival and protect the rhino. My Australian friends walked with me for a week. 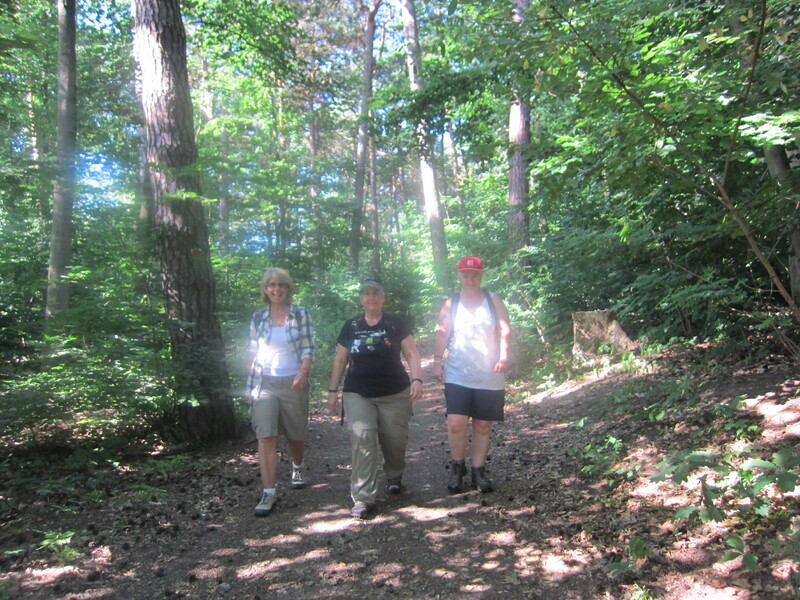 We had a fantastic time walking despite sore bodies and blisters. They put in a stellar performance and it was so great to have them with me for a good week. They did mention though that the day to day walk does take a lot of energy and stamina!! Good efforts girls, well done! I have asked them to write a blog describing their experiences. This will be coming soon (won’t it girls ?? ).